Readers of this page already know that Slimbridge Dowsing Group has had some remarkable and fascinating speakers over the years. Which can mean it is too easy to forget just how knowledgeable and extraordinary our rank and file members are too. So occasionally we have an afternoon without a speaker, and simply take it in turns to recount our own dowsing experiences. Our meeting on Thursday 12th July was such a time, and the star of the show was a lady member called Ros who had recently bought a brass Tibetan singing bowl to use for sound healing. 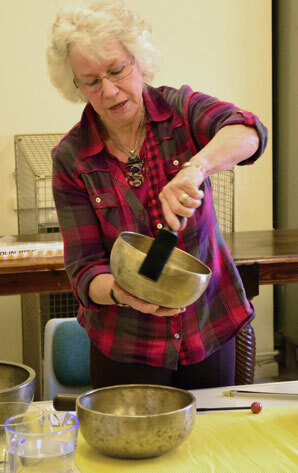 Ros Milward 'plays' the antique brass Tibetan singing bowl she made in a previous life. Photo by Patrick Callaghan. The selection process had been a lengthy one, it is important to get the right singing bowl for you. Jan van der Elsen on Sula Lightship, moored just south of Gloucester Docks, ‘played’ several antique singing bowls for Ros to hear with her eyes closed, and she eventually narrowed it down to a choice of two. Then the final one. Ros told us that Tibetan singing bowls were made by the monks themselves for their own personal use. The varying combination of seven different sacred metals gave each bowl its own unique sound, for the exclusive use of the maker. When the owner-monk died, his bowl was of no use to anyone else, and was simply put into storage. This is why so many are now available to the tourist trade - at a price. Previous lives became something of theme on this occasion, since two other members had recently visited the Healing Weekend in Somerset, and learned how to dowse and ask if there was Karma from a previous life that needed healing in this one. It seems we meet the same people each time round, so someone who was your mother in a previous existence, might well be your husband in this life. This accounts for that ‘soul mates’ feeling, and love at first sight, when you ‘recognise’ someone as being just right for you. Our male members tend to be more prosaic than the ladies, and they reported using dowsing to find lost items, which is very useful, or asking their rods enough questions to come to the realisation that losing something was OK and it was time to let it go anyway. Other members talked about their personal experiences at recent dowsing group events; Peter Gibson told us about finding indications of roundhouses and longbarrows, cottages and churches, barns and burial sites, at both Cam Peak and St Augustine’s Farm in Arlingham recently. He showed us Google aerial maps that subsequently showed humps and bumps and lumps in the landscape that substantiated his findings. It made us all want to rush out and start digging! 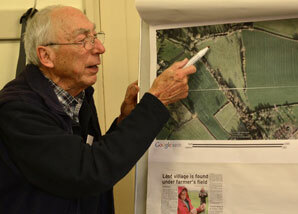 Peter Gibson shows the aerial Google map of St Augustine's Farm, Arlingham, where we dowsed and found indications of roundhouses and longbarrows, cottages and churches, barns and burial sites. Photo: Patrick Callaghan.